to tennis courts, swimming pool, club house, and private beach. The unit is fully furnished, towels, pots/pans, plates, and other typical housewares. Newly renovated bathrooms, bedrooms, and flooring. This is my home away from home that I would love to share with you. Families welcome. We use this condo typically for long weekends or a short getaways to escape the hustle and bustle of Miami and occasionally for celebrations. However the unit is available all year round. We ask that MINIMUM STAY is 30 days or more. NO SHORT-TERM STAYS PLEASE. Step out the south facing back door on to one of the 2 tennis courts on the property. A few more paces west and your in the club house and pool area. Just beyond that, the Gulf of Mexico and breath taking sunsets every night. No pets means you can roam paradise barefoot without concern of finding an unwelcomed surprise to step in. 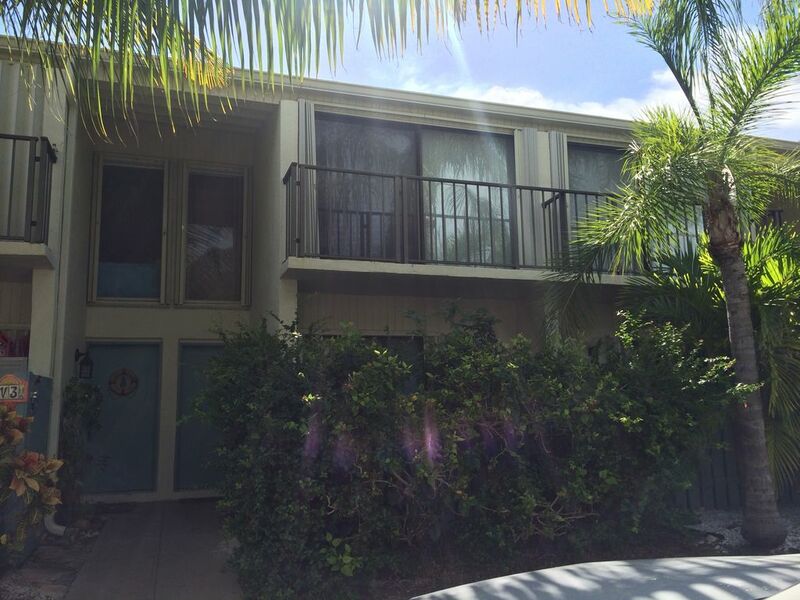 Unit has a single zone AC for the whole condo, with the thermostat located upstairs. Beds have all linens and extra linens are readily available. New Over/Under Style Washer & Dryer. No assigned parking spots, however there is more than ample parking in close proximity to front door. Even on busy holiday events. Many bath and beach towels are available. Water service is very expensive in the keys. We ask that renters use the dishwasher only for full loads or wash smaller loads by hand. Refrigerator is kept empty when unit is not is use. Renter is responsible for their own food and supplies. Kitchen is stocked with dishes, flatware, pots & pans, and typical appliances and cleaning products. A second eating area is in the kitchen near the front door that seat 4-5 comfortably. There are books and magazines located throughout the unit...... J.R. Tolken, Mark Twain, John Grishim, and other notable authors are part of our home library collection. Some boards games are available, Chess, Monopoly, etc. Some VHS and DVD's available. Film rating ranges from PG to R.
Master bedroom has balcony facing North. Small patio in front, back yard opens to tennis court. 2 courts on property, 1 is directly behind our unit. Sorry, our unit was built before ADA compliance. Spiral staircase to upstairs areas. Pool rules and regulations are posted in the pool area. Pool is a salt water pool, not chlorinated. Service Animals are prohibited from entering the waters of the Swimming Pool. Please do not ask about short term stays. We are requesting stays of 30 days or more, thank you for your understanding. Cancellations OVER 30 calendar days from the beginning of scheduled rental dates a fee of $300 will be deducted and the remaining balance of quoted rental value is refunded. If you cancel WITHIN 30 calendar days from the beginning of scheduled rental dates the fee is 50% of total quoted rental value and the remaining balance is refunded. 30 Day Minimum Stays only. SERVICE ANIMALS WELCOMED, but NO PETS ALLOWED. Cancellations OVER 30 calendar days from the beginning of scheduled rental dates a fee of $300 will be deducted and the remaining balance of quoted rental value is refunded. If you cancel WITHIN 30 calendar days from the beginning of scheduled rental dates the fee is 50% of total quoted rental value and the remaining balance is refunded. NO PETS allowed, SERVICE ANIMALS are OK. Cancellations OVER 30 calendar days from the beginning of scheduled rental dates a fee of $300 will be deducted and the remaining balance of quoted rental value is refunded. If you cancel WITHIN 30 calendar days from the beginning of scheduled rental dates the fee is 50% of total quoted rental value and the remaining balance is refunded.